Felt balls, don't you just love them?! They hold the most beautiful intense colours and that can bring joy to any room. 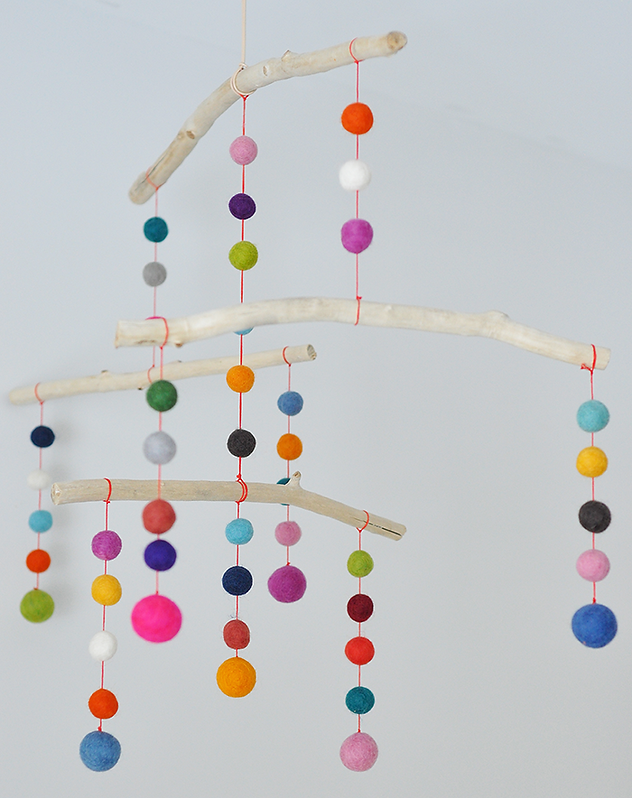 If you want to add a pop of colour somewhere, anywhere, this list of felt ball DIY projects offers great inspiration. What's more, felt balls are easy to use and your completed project will look like you've spent lots of dosh at a high-end homeware store. Nice one. In bedrooms - boys, girls and adults, these look gorgeous draped over the corner of a mirror or utilising some wall space which needs a some 'punch' or framing a series art works they have created. Add some warmth to your kitchen over the winter months with a DIY felt ball trivet or DIY coasters. Trivets are just large coasters which are used for placing hot kettles, plates, and pots to protect your surface. It's simply a matter of stitching the felt balls together using an embroidery needle and embroidery thread and working it into a round or square shape. Alternatively, you can glue them to cork coasters like they do here. Remember to lay out your colour pattern before you start. And, because these are made of wool they will absorb moisture without causing mildew. Felt ball baubles make perfect ornaments for Christmas and are made using polystyrene balls, felt balls and a trusty hot glue gun. This one is just gorgeous and a lovely way to celebrate Christmas if more traditional decorations aren't your thing. I will definitely be making one of these for this Christmas season. A polystyrene wreath shape, hot glue gun and lots of felt balls - magic! If you're looking to 'jazz up' a cushion or pillow cover, a few well placed felt balls sewn into the seam will give it a new lease of life. Click here to purchase your felt balls in whatever colour combination you are looking for.